Nomination papers for this fall’s municipal election won’t be available until May 1. But I found this attached to my front door knob Friday afternoon. First I’m guessing the TAB quote is old….perhaps going back to the Andy Levin era since Julie Cohen hasn’t written any editorials or endorsements that I’m aware of. But is the Fuller quote old or new? Is the mayor endorsing candidates? And, if so, why so soon? Did Auchinclos get her blessing before publishing her quote? Finally, why would an incumbent city councilor feel the need to send out canvassers for a part time job eight months before an election? Greg, strategically not a bad move. If a candidate is perceived as strong he may ward off any potential challengers. In addition, he may want to increase his name recognition in your neighborhood for the Municipal Election. Jake’s strident opposition to implementing the will of the voters regarding siting cannabis stores in Newton has left him needing to undertake some serious damage control. He has alienated many of his original supporters — like myself — who have become extremely disappointed that Jake seems to think that on a number of issues like cannabis his way is the only way, regardless of whether the vast majority of his constituents feel differently. 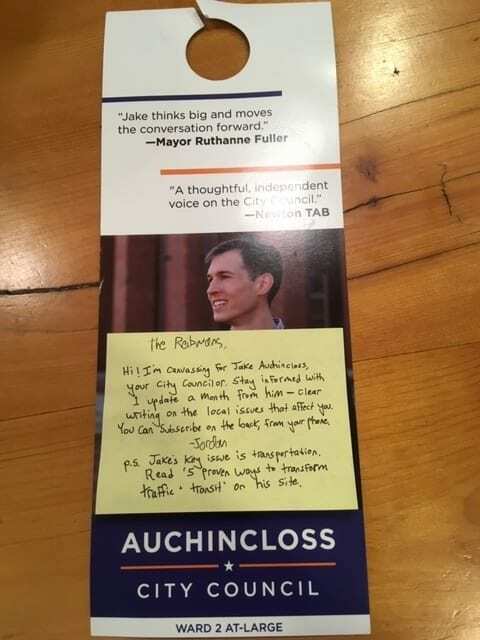 For someone who burst onto the Newton scene with such potential, and who obviously still harbors ambitions for higher office, Jake will likely spend a ton of dollars to rehabilitate himself in this year’s low turnout election. I wish him luck, but like many others I have my doubts . Ambition and money to burn. Jake’s got $31,000 in his campaign war chest. By comparison, the other At-Large Councilor from Ward 2, Susan Albright, has $800. He has the money to campaign early and often with the hopes that he will have an impressive victory in the fall that will look great for his next move, State Senate. Cynical crew, here! I canvassed a lot in 2015. I canvassed a lot in 2017. I’m going to canvass a lot in 2019. It’s the best (only?) way to have a broadly representative conversation with my constituents. Voters want to be assured that the state and city are making transportation investments commensurate with development. And they are 100% right to be pressing on that. The inner core of Greater Boston is not investing and managing transportation on par to keep up with more intensive land use. It’s the best (only?) way to have a broadly representative conversation with my constituents. I agree and I applaud every local official who prioritizes interacting with constituents, especially that overwhelming majority of citizens who don’t attend meetings, comment on blogs/list serves etc. Those interactions are so important. Maybe it’s just me but it’s having someone canvas on your behalf, eight months before the election (as opposed to a last minute get out the vote effort) that strikes me as odd. On more thing: I have no idea if the canvaser who stopped at my house Friday was paid but this idea of city council candidates having staff (Ward 5 hopeful Bill Humphey recently whined about the challenge of getting along for a week without his) is a relatively new trend in Newton. I respect how hard and time consuming campaigning can be but I’m not sure how productive this is to our overall process. Auchincloss demonstrated an astounding lack of respect for his constituents and the democratic process by siding with prohibitionists seeking to revote the 2016 ballot initiative that legalized cannabis. He has repeatedly used his position as a City Councilor to obstruct implementation of that voter approved law. Why would anyone vote for a candidate who not only failed to defend a vote of his constituents, but actually tried to undermine the results of that vote at the ballot box? Greg, maybe a little bit of a cheap shot there on Bill? It takes a team to run a campaign, and when a key member is out, I assure you it’s felt quite keenly. Not only did I not support Jake in 2015, I campaigned against him. I was also the chair of one of the ballot committees opposing the ban of retail cannabis shops in Newton. Now it’s 2019, and I’m supporting Jake in the upcoming election because he works hard, does his homework, and makes designs based on research. Do I wish he’d supported the No on the Ban position? Yes, but I *rarely* make a decision about a candidate based on one decision – so many votes, so little time, and we’re likely to be on the same side with the next controversial issue as I often agree with his positions. @Chris: Guilty as charged. I’m sure I could have praised that differently. But I won’t back off my larger question: Why should a city council contest need “staff,” especially a ward seat; especially eight months before we vote; and especially more than a month before nomination papers are even available? And is that healthy/productive for our process? Does it make it even harder for candidates to even think about running? Our councilors don’t have “staff” when elected. What does needing one to get elected tell us? Was referring to his “campaign staffer” just a pretentious way to refer to “my friend/volunteer who’s been helping me with my campaign”? Or does he actually have a paid campaign staff member 8 months before an election for a ward seat??? @Greg – again speaking from experience, it’s quite a challenge to get space in the voters’ awareness if one is not already an incumbent. Whether through volunteers or interns, candidates need help is spreading word and becoming known to the electorate. Ours is a crowded ballot, and it takes quite a bit of effort and help to become known. Volunteers and other assistance are often the only way to get to enough doors, or to get the other things done so the candidate can be on the doors themself. Jake, will you support reducing the size of the City Council? What will you do to make it happen?